The Sunrisers Hyderabad yesterday lost their opening game against Kolkata Knight Riders by six wickets at the Eden Gardens. But this did not stop them from celebrating their teammate Shakib Al Hasan’s birthday. After the team reached the hotel, a cake was arranged by the hotel management for the all-rounder. Shakib Al Hasan cut the cake and the team sang Happy Birthday for the all-rounder. From the looks of it, it seemed that he knew that his teammates would attack him by painting his face with cake and Hasan was in the bid to leave the place ASAP. KKR vs SRH, IPL 2019 Stat Highlights: Andre Russell Guides Home Team to Six-Wicket Victory. But a few SRH players caught hold of him and painted his face with cake. Post this Shakib Al Hasan had a sweet surprise in-store as he had a word with his daughter back home. 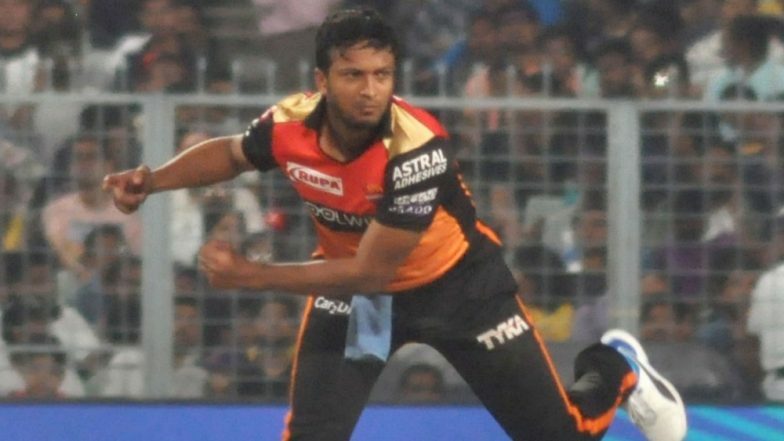 Needless to say, the sweet surprise left Shakib Al Hasan smiling ear-to-ear. The video and the pictures of the same were shared on the official page of the Sunrisers Hyderabad.KKR beat SRH by 6 wickets. Shakib Al Hasan speaking to his daughter. Talking about the match yesterday, David Warner made a great comeback as he scored 85 runs for the team and gave a solid start to SRH. The team posted a total of 181 runs. In reply, Kolkata Knight Riders made 183 runs and won the game. It was Andre Russell and Shuman Gill’s cameo that guided the team to victory.